While humans are thought to have invented writing only about 5000 years ago, human oral verbal communication is surely much older. Important recent research indicates that humans across a wide expansion of Eurasia shared present-day sound-meaning verbal forms about 15000 years ago. Writing was not necessary historically to support widely dispersed, specific verbal forms that have endured for 15000 years. Linguistic units evolve less rapidly the more frequently that they are used. While particular frequently used words have less than a 50% likelihood of being replaced in 10000 years, most words, including important words like mother and man, have a half-life of 2000 to 4000 years. Large-scale word replacement has occurred within historical language families within the time horizon of the invention of writing. But there are also many other things Jesus did; were every one of them to be written, I suppose that the world itself could not contain the books that would be written. Given that this writing figure was known across western Eurasia 2000 years ago, it probably was created considerably earlier. If the ocean were ink (wherewith to write out) the words of my Lord, sooner would the ocean be exhausted than would the words of my Lord, even if we added another ocean like it, for its aid. In the eleventh century, the rhetorical figure appeared in a liturgical poem that a rabbi composed in Aramaic for the Jewish holiday Shavous. By the thirteenth century, the figure was known across western Eurasia in a wide variety of languages. Although rarely occurring relative to words like “mother,” the figure has been conserved to the present in a wide range of contexts. Professional self-understanding and self-interest of writers probably helps to explain the “sea of ink” figure’s longevity. Religiously important writings conserve common culture. After the rhetorical figure was included in Jewish religious writings and the Qur’an, it would last as long as these religions. But the earlier history of the figure, and its geographically widespread instantiations in non-religious contexts, still needs explanation. The figure presents writing as an important function within the natural world. It describes writing as a natural measure of great acts. The figure is thus suited for scribes affirming, with the solidarity of a common form, their professional importance. That’s a biting satire on the still prevalent scholarly practice of concluding a scientific journal article or research report with a call for more research. Professional self-interest in writing goes all the way back to the origins of writing. Yet alternatives remain: curiosity, entertainment, whimsy, and hope. Id. p. 1. Pagel, Atkinson & Meade (2007). From the Sanskrit legend of the Ten Avatars (Malabar version), concerning Vishnu in his eighth avatar appearing as Kishna, cited in translation, Linn (1938) p. 952. I’ve made minor stylistic adaptations. A similar figure exists in the Vasavadatta, the oldest known romantic novel in Sanskrit. Id. p. 953. Rabbi Jochanan ben Zakkai, founder of the religious academy at Jabneh, cited in translation, id. p. 954. Nearly the same saying is attributed to Rabbi Jochanan in the Talmud, Tractate Sabbath, fol. 11. Id. Qur’an, Surah 18:109, Surah 31:27, text above, in lineated form, from Abdullah Yusuf Ali, The Meaning of the Holy Qur’an. The poem is the Akdamut. Rabbi Meir bar Yitzchak (“Nehorai”) composed it in Worms, Germany, in the eleventh century. Hoffman (2009) provides historical context and an English translation of the Akdamut. Linn (1938) documents instances in a wide variety of languages. Eliot (1942/1949), written around World War II, pushes that point further than most. For other evidence of poetic forms conserved across Indo-European languages, Watkins (1995). Oliver Wendall Holmes, Sr. “Cacoethes Scribendi,” in Holmes (1890), cited in Lin (1938) p. 965. Foolscap is paper of a particular size. 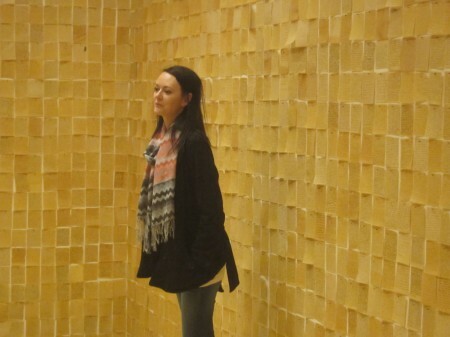 [image] Visitor to Hirshhorn Museum exhibit, Over, Under, Next: Experiments in Mixed Media, 1913-present, inside Ann Hamilton’s installation Palimpsest, 1989. Eliot, Thomas Stearns. 1942, rev. ed. 1949. Christianity and culture: the idea of a christian society and notes towards the definition of culture. London/New York. Hoffman, Jeffrey. 2009. “Akdamut: History, Folklore, and Meaning.” Jewish Quarterly Review. 99 (2): 161-183. Holmes, Oliver Wendall, Senior. 1890. “Over the teacups.” Column. Atlantic Monthly. Mar. Linn, Irving. 1938. “If All the Sky Were Parchment.” PMLA (Proceedings of the Modern Language Association). 53 (4): 951-970. Pagel, Mark, Quentin D. Atkinson, and Andrew Meade. 2007. “Frequency of word-use predicts rates of lexical evolution throughout Indo-European history.” Nature. 449 (7163): 717-720.